Increasingly, U.S. families are letting go of the idea of placing aging parents into long-term care facilities and would prefer to have them to move into their homes. In fact, according to Pew Research Center, 57 million individuals live in multigenerational households. That is over 18 percent of our country’s population. The numbers are continuing to climb as a growing number of aging parents choose to live at home with family rather than downsizing or moving into senior facilities. As a result, this trend is changing the home improvement industry, with more and more projects focused on specific designs that create a separate, yet connected living space, with aging parents in mind. Contractors report seeing a broad range of related projects, from adding wheelchair accessibility and small safety upgrades to adding extra space onto the home in the form of a suite. Typically referred to as a “Mother-In-Law Suite,” this type of home addition for aging parents is commonly smaller living spaces that are accessible by the main house via a shared door. These suites are often converted garages, basements, or sometimes even brand new additions. If you are contemplating the idea of moving an aging parent into your home, keep in mind that your decision will likely impact your entire family, so it should be a collaborative decision. Carefully consider how much space you currently have in your home. If your living space is limited, consider a remodel in the form of a basement, attic, or garage to create more space. You might also consider a small home addition. 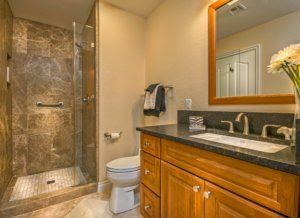 Think about factors like whether you will need to install grab bars next to the toilet and in the shower. Also, do your parent(s) wants privacy in the form of a separate entrance or their own space for cooking or doing laundry. Finally, answer questions, like: Are there more steps than your parent can climb? Are your home’s hallways wide enough to potentially accommodate a wheelchair? Is there a need to install emergency pull cords anywhere? Ensure everyone in your family agrees to the new living arrangement. Determine what your expectations are for the new agreement before moving forward. Be sure to create the addition following universal design guidelines. Carefully think about your space: are kitchen counters, bathrooms, and doorways wheelchair accessible? Does the walk-in shower have grab bars? Opt for entry-level additions so you can eliminate the need for stairs. Check local municipal building codes to ensure that accessory dwellings are allowed. For more information, download our Remodeling Guide: Housing Our Aging Parents: How to Retrofit Your Home to Care for a Senior Loved One today. At Republic West Remodeling, we believe the trend in home additions for aging parents will not slow down anytime soon. We have proudly worked with many families in the Phoenix and Scottsdale area who took steps to bring their aging parents to live in their homes. Contact us today to discuss how we can help get your family into a comfortable living space.